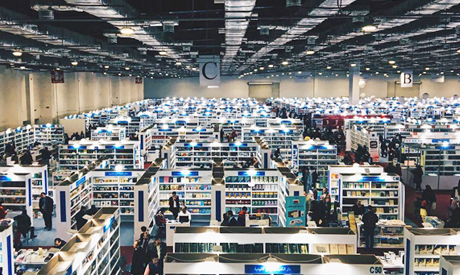 The 50th Cairo International Book Fair (CIBF, 23 January-5 February) folded on Tuesday, having drawn in nearly 376,000 visitors in its first 10 days. Such success had been contested since the decision was made to relocate it from the fair grounds in Nasr City to the Egypt International Exhibition Centre in the Fifth Settlement, New Cairo, significantly farther out from the city centre. Even with a dedicated bus service — which worked well for some but not others — the location was difficult to reach, posing a huge obstacle in the way of the golden jubilee round, but with state-of-the-art facilities and sophisticated organisation, this may be the closest round yet to a world-standard book exhibition. Events were well organised in well-equipped round-table rooms on the top floor and there were plenty of clearly identifiable young volunteers everywhere with apps to help them guide visitors. Somewhat disappointingly, books could only be located by publishing house and the only payment option available was cash. Here are a few of the acquisitions Al-Ahram Weekly nonetheless managed to make.